More and more projects are using Azure SQL as the database back-end for Sitecore (so long as they’re running Sitecore 8.2 and newer — if alignment to Sitecore official support guidance is important to you). This sets up a new class of performance considerations around Azure SQL, and I want to share one tuning option we learned while investigating high DTU usage for the Sitecore xDB “ReferenceData” database in a Sitecore 9 PaaS build. We wanted to off-load some of the work this “ReferenceData” database was doing, and investigations into which Azure SQL queries were causing the DTU spikes pointed to INNER JOINs between the ReferenceData.DefinitionMonikers and ReferenceData.Definitions tables. Sitecore support pointed us in the right direction at this juncture, since the default DictionaryData was using AzureSQL for persistence — we should consider a store more suited to rapid key/value access. If this sounds like a job for Redis, you’d be correct, and fortunately Sitecore has an implementation that’s suited for this type of dictionary access in the Sitecore.Analytics.Data.Dictionaries.DictionaryData.Session.SessionDictionaryData class. What this boils down to is the implementation in Sitecore.Analytics.DataAccess.dll of Sitecore.Analytics.DataAccess.Dictionaries.DataStorage.ReferenceDataClientDictionary was shown to be a performance bottleneck for this particular project, so changing to use the Sitecore.Analytics.dll with it’s Sitecore.Analytics.Data.Dictionaries.DictionaryData.Session.SessionDictionaryData aligns the project to a better-fit persistence mechanism. We considered if we could improve upon this progress by extending the SessionDictionaryData class to be IIS in-memory regardless of the Sitecore session-state configuration; there would be no machine boundary to cross to resolve the (apparently) volatile data. Site visitors would require affinity to a specific AppService host in Azure, though, with this and it’s possible – or even likely — that Sitecore assumes this is shared state across an entire implementation. We talked ourselves out of seriously considering a pure IIS in-memory solution. I think it’s possible we could improve the performance with the default ReferenceDataClientDictionary by tuning any caches around this analytics data, but I didn’t look into that since time was of the essence for this investigation and the SessionDictionaryData class looked like such a quick win. I may revisit that in the next iteration, however, depending on how this new solution performs over the long term. Part of our role at Rackspace is to be pro-active in tuning and optimizing Sitecore implementations for our customers. Sometimes, the “optimizations” come more in terms of cost-savings instead of performance benefits, and sometimes there is a correlation. Here’s an optimization that is more oriented to cost-savings. We have customers using MongoDB for both private and shared session state in Sitecore, as well as xDB data collections; they’re using a hosted MongoDB service through ObjectRocket which provides provisioning elasticity, good performance, and access to really strong MongoDB pros. We noticed old HTTP session data accumulating in the session collections for one customer, and couldn’t find an obvious explanation. These session records shouldn’t be leaking through the MongoDB clean-up logic that’s part of the Sitecore API (Sitecore.SessionProvider.MongoDB.MongoSessionStateProvider), but we wanted to correct it and understand why. The catch was, the customer’s development had several higher priority issues they were working on, and sifting through a root cause analysis of something like this could take some time. In the interim, we addressed how to clean out the old session data from MongoDB — if the customer was using SQL Server for sessions state, a SQL Server agent deleting expired sessions could be easily employed . . . but that isn’t an option for MongoDB. At Rackspace, we began evaluating options for a MongoDB equivalent to the “clean up old session records” process and so I started by reviewing everything I could find about data retention for MongoDB and Sitecore. It turns out there isn’t much. There isn’t mention of data clean-up in the Sitecore documentation on shared and private session for MongoDB. There isn’t an explicit <agent> configured anywhere, either. With Reflector, I started looking through the Sitecore.SessionProvider.MongoDB.MongoSessionStateProvider class and I didn’t see any logic related to data clean-up. I did finally find some success, however, in reviewing the Sitecore.SessionProvider.MongoDB.MongoSessionStateProvider class that extends the abstract Sitecore.SessionProvider.SitecoreSessionStateStoreProvider class. This was all helpful information to the broader team working to determine why the records were remaining in MongoDB, but we needed a quick non-invasive solution. MongoDB supports “Time to Live (TTL) Indexes” which purge data based on time rules. Data older than 1 week, for example, could automatically be removed with this index type. That’s surely acceptable for sessions state records that leak through the Sitecore API. We coordinated with the ObjectRocket team and are setting the customer up with TTL Indexes instead of the default; this should dramatically reduce the data storage footprint. I really wonder, though, how many Sitecore implementations intend to store all the xDB data indefinitely and have a strategy for making use of all that old, ever-accumulating, data? I think the promise of xDB analytics-based presentation rules is far greater than the reality. I see many organizations lacking a cohesive plan for what data to gather into xDB, and how to effectively make use of it. I think TTL Indexes for MongoDB would be a good safety net for those companies still sorting out their path with xDB and analytics, without having to bank massive volumes of data in MongoDB during the maturation process. One final note: since conserving disk space is a priority, performing a weekly data compaction for MongoDB is a good idea. This fully reclaims the space for all the expired documents. This post describes the configuration of general session timeouts in Sitecore. Implementation teams are often interested in how to approach session management, cautious of situations where authors are logged-off after working with a piece of content for an extended amount of time (such as authoring in a RichTextField for 30+ minutes ). As I explain below, focusing on just http session timeouts will only partly address the problem. Internally, Sitecore has both regular http session timeouts and authentication timeouts that factor into this. Some teams are tempted to trigger ajax calls to the server to extend the session lifetime . . . but as you’ll see, this is already handled by Sitecore and further customization of this process could weaken the security of the system. For additional background: Sitecore made significant improvements to the session management logic with Sitecore 6.6 Update-7; proper support for sliding expiration was introduced, and full respect for standard ASP.Net authentication configuration was added to the platform. This may add to the confusion on this subject, as work-arounds and various custom patches may have been necessary for an older Sitecore implementation to achieve what is now out-of-the-box session support. In a typical non-Sitecore ASP.Net application, after session expiration, all the work will be lost as the user will need to log back in to the system. This is exactly the lost work scenario we’ll aim to avoid. The timeout value is in minutes, so 180 equals 3 hours. Sitecore recommends a short session timeout for CD servers to conserve server resources. A default of 20 minutes is usually adequate, but each implementation is different. This has no relevance to the lost work scenario as CD servers aren’t where authors work with editing content, but I include this note in the interest of showing the complete configuration for Sitecore and session timeout management. A “Persistent” auth session is created when the user logs in and has the “Remember Me” box checked on the login form; the “Not-Persistent” auth session is when this is not checked. See the login screen below for reference. The two types of auth sessions use different locations to configure timeouts. Both locations are, by default, in the web.config file of the Sitecore webroot. The value of the “timeout” attribute controls the lifetime of the auth session in minutes. If it’s not specified in the configuration, the default timeout value is 30 minutes. For clarity, it’s a good practice to explicitly set a value for this property. The value of the “slidingExpiration” attribute controls whether sliding expiration is enabled. Note that the slidingExpiration value defaults to true, but for clarity it’s a good practice to explicitly include it in the forms definition xml node. Lifetime of “persistent” Sitecore auth sessions is controlled by the “Authentication.ClientPersistentLoginDuration” setting; the value is in days. //Start of customization. Not sure you really wan't to do this . . .
Again, this is not generally recommended as authors could potentially never have their authentication tickets expire when their computer is idle, but happens to still have a browser open to the Sitecore Client. If an implementation is using Active Directory integration (the standard Ldaplogin.aspx with the Sitecore AD Module), it’s programmatically the same as not checking the “remember me” checkbox and so it uses not-persistent auth sessions. If you’re using standard Sitecore AD integration, the authentication and forms xml nodes are most relevant to configuring authentication timeouts. Session timeout and authentication session timeout are two different concepts, but often get combined together when talking about ASP.Net web application “sessions” with Sitecore. For the Sitecore Content Management servers, authentication session expiration is more likely to cause an author to be redirected to the login page and cause the lost work scenario. Sitecore introduces no KeepAlive functionality for authentication sessions as it could be a security vulnerability. 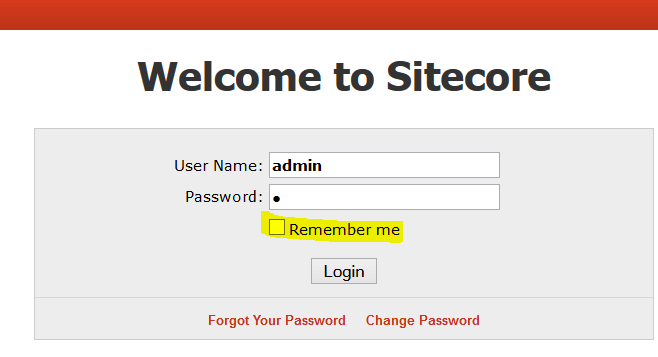 Confusion can be caused by testing with a regular Sitecore account (not Active Directory) and one checks the “remember me” checkbox on the login page . . . then the user is testing with a persistent auth session and not exercising the configuration relevant to Sitecore’s AD module. Armed with this knowledge, Sitecore implementations can make the best use of the session timeout settings. 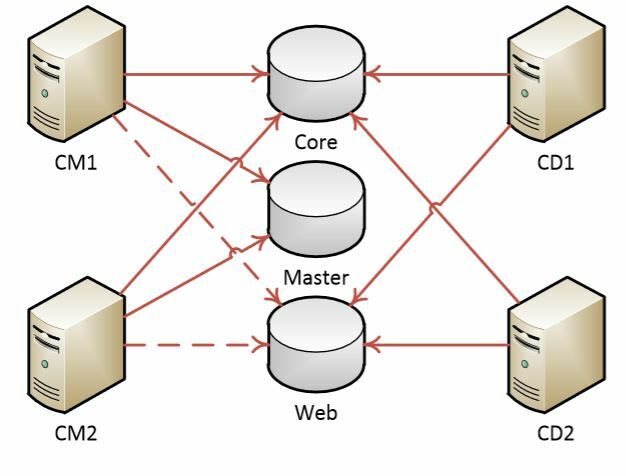 Most Sitecore implementations I work with are using multiple active Content Delivery (CD) servers; more rarely, a project will use multiple Content Management (CM) servers. These multi-server setups are considered “scaled” in Sitecore terminology, and the foundation for setting up a scaled implementation is the Sitecore Scaling Guide. That Scaling Guide is a good reference, but can gloss over certain details or doesn’t speak directly to a customer’s scenario. Managing HTTP Session state is one such topic. I’ve compiled something like the following analysis for a couple Sitecore customers in the last few weeks, so I’m going to post a general version here since it reflects the state of handling Sitecore session state as of right now, February 2015, for a customer running Sitecore 7.2 today but considering upgrades in the next year or two. The customer isn’t running on Windows Azure, but they are weighing it as an option going forward in the years to come — and this is relevant as you’ll see below. For Sitecore Content Delivery (CD) servers, out-of-process session state is fully supported. Changing from the default InProc setting to use an out-of-process provider is the same as with any other ASP.Net web application; the “mode” attribute of the sessionState element in the web.config file governs this functionality. See https://msdn.microsoft.com/en-us/library/ms178586%28v=vs.140%29.aspx?f=255&MSPPError=-2147217396 for documentation on StateServer or SQLServer (the two main choices for out-of-process session). Besides just configuring the sessionState mode setting, you should know that there may be other provisioning and setup (the Microsoft documentation I linked to covers it thoroughly). In addition to StateServer and SQLServer, one could use the “Custom” mode to use something like Redis. The Microsoft.Web.Redis.RedisSessionStateProvider is popular because of fast performance metrics; in the words of the movie Zoolander, that Redis is so hot right now! Redis is a relatively new option for session state management, however, and Sitecore has not been fully regression tested with it. Still, I know of some customers anecdotally reporting a positive experience with the RedisSessionStateProvider in spite of it being considered “experimental” by Sitecore support. I mention Redis because it’s a popular topic right now, but for a customer cautious of using officially “experimental” approaches in Sitecore, I think you have to avoid Redis unless you’re on Azure. Furthermore, as I’ll go into, there are session considerations in Sitecore 7.5 and 8 that for the moment make Redis less attractive. For Content Management (CM) servers, support for out-of-process session in Sitecore 7.2 is considered “experimental” as it hasn’t been fully regression tested. See https://kb.sitecore.net/articles/901069 for the official statement from Sitecore on this, but my recommendation is to use the default InProc session provider for their CM Server and configure a sticky session for Content Management operations. This is usually not too big a pill to swallow for companies, and know that in the months to come this blog post will no longer be relevant as Sitecore is continuing to work on liberating CM session state. One can implement their own provider that will support the Session_End event and use it (for example, Microsoft provides the RedisSessionStateProvider, but it does not support the Session_End event . . . so one would need to extend it to support the Session_End behaviour). Most organizations prefer to run on a platform fully supported by Sitecore without customization unless absolutely necessary, and so this limits the session state options. SQL Server is faster than MongoDB in the performance tests for session state relevant to Sitecore, so SQL Server is the out-of-process provider I’m recommending for a customer who is currently on 7.2 and has their sites set on 7.5, 8, and beyond in the medium term (next year or two). Returning to the hypothetical organization determining their session state approach for 7.2, it’s a pretty cut-and-dried decision in the abstract since there is only one out-of-process provider that satisfies both Sitecore 7.2 and Sitecore 7.5+ requirements today: SQL Server the session provider. I say “in the abstract” since there are businesses with investments in Memcached out there who would probably not blink an eye at using a custom out-of-proc provider with Sitecore and adding a session_end to their Memcached approach, for them this could be an advantageous use of their resources and in-house expertise . . . but my recommendation here is for an average company running the conventional Sitecore stack of ASP.Net, IIS, SQL Server.